Following are selected videos from the archive collection. See also our NEW! YouTube Channel, plus our comprehensive Doug Engelbart Video Archives collection at the Internet Archive, or our Top Picks from that archive. See also special subcollections Engelbart Academy, Historic Events, and MIT/Brown Vannevar Bush Symposium. The Mother of All Demos (1968) - historic 100-minute live demonstration by Engelbart and his lab covering all aspects of their innovative breakthroughs in interactive computing, including the world debut of the mouse, hypermedia, groupware, computer supported software engineering, and more. 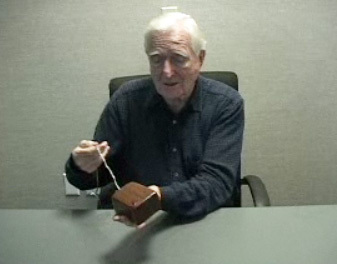 Visit the MouseSite online at Stanford University, and Doug's 1968 Demo page at the Doug Engelbart Institute, both rich with additional resources re: the event, the seminal visionary work leading up to it, and subsequent retrospectives from Engelbart and his original team. Augmentation Systems and Information Science (1969) - One year after the 1968 demo, Doug and his team gave a repeat performance at the 32nd Annual Meeting of the American Society for Information Science (ASIS), San Francisco, CA. 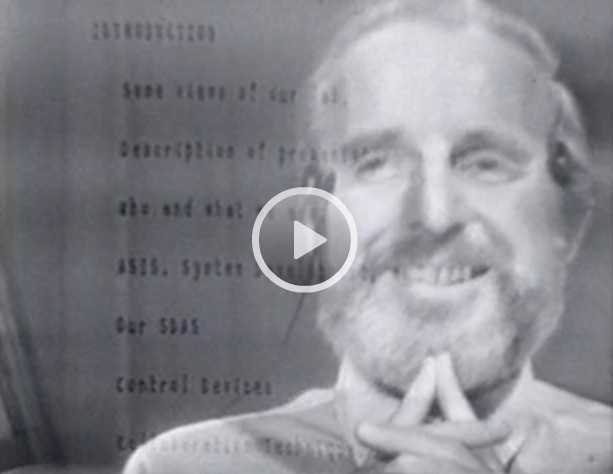 This demo/presentation was filmed on 3 reels, now available for viewing at the Internet Archive's Doug Engelbart Archives collection: Reel 1, Reel 2, Reel 3. 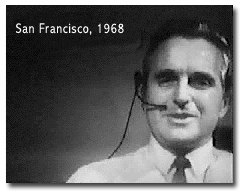 Engelbart's Unfinished Revolution (1998) - celebrating the 30th anniversary of the 1968 Demo. A remarkable one-day event at Stanford University marking the 30th anniversary of the mouse made public in 1968. Doug appears in the 9:15 Panel Discussion and the 2:00 Conversation. See our website for this commemorative event. 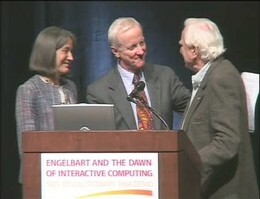 Engelbart and the Dawn of Interactive Computing (2008) – celebrating the 40th Anniversary of the 1968 Demo. Speakers and panelists reflect upon Doug Engelbart's vision for the future, and the brilliant breakthrough innovations that came pouring out of his SRI lab in the 1960s and '70s. See our website for this commemorative event, with links to photos and video recorded sessions, as well as Christina's Driving Vision presentation and accompanying slides. 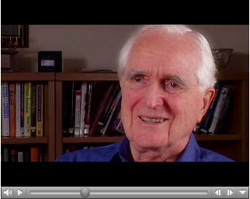 NMC Tribute to Doug Engelbart (2009) - Doug's 2002 interview with the New Media Consortium, edited into a short movie in honor of his 2009 NMC Fellows Award presentation, updated with more photos from our video archive in 2013. The movie begins with selected clips from his 1968 Demo. MIT/Brown Tribute to Vannevar Bush (1995) - This two day Vannevar Bush Symposium marked the 50th anniversary of Vannevar Bush's seminal 1945 article "As We May Think", which proved an inspiration to the great pioneers of the information age. 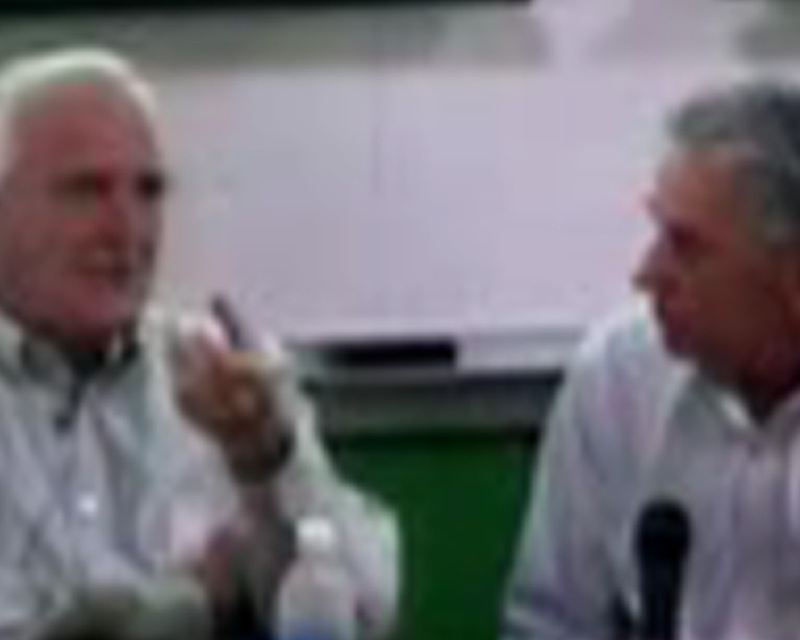 Watch Doug and other luminaries reflecting on the impact of Bush's call to action. Engelbart's Colloquium at Stanford (2000) - An In-Depth Look at "The Unfinished Revolution", a 10-session seminar for industry leaders presented at Stanford University; see the comprehensive Colloquium website for program summary, guest speakers, slides, lecture transcripts, and more. Watch the video recorded sessions at the Stanford Center for Professional Development public webpages. Bootstrap "Paradigm Map" Presentations (1990s) - a special subcollection of presentations by Doug Engelbart 1993-1998 using his interactive Paradigm Map to unfold his vision, concepts, and call to action in the context of his overarching conceptual framework. Bootstrap Seminar Intensive (1992) - Throughout the 1990s, Doug and Christina produced a series of three-day, one-day, and half-day management seminars at Stanford University. This three-day intensive, was presented March 24-26, 1992. See our Bootstrap Seminar webpage to watch all 12 sessions and view the slides and handouts. The Augmented Knowledge Workshop (1986) - Doug's presentation at the History of the Personal Workstation Conference in Palo Alto, CA, January1986, detailing the evolutionary development of his seminal work leading up to his 1968 demo and beyond, showing historic photos plus selected footage from the demo. 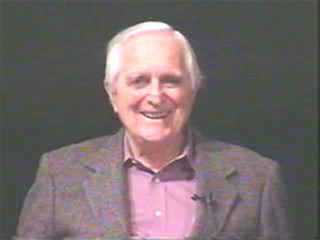 JCN Profiles: Visionary leaders of the Information Age (1995) - Marc Doyle interviews Doug Engelbart for this episode of Visionary Leaders, a production of the Jones Computer Network - Mind Extension University Education Network, March 1995. 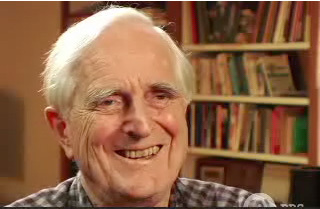 Doug Engelbart Oral History (2002) - John Markoff interviews Doug Engelbart for the Computer History Museum Oral Histories Project. Logitech Interviews Doug Engelbart (2004) - in this segment, Doug tells the story of how he invented the computer mouse. He is holding the original mouse. 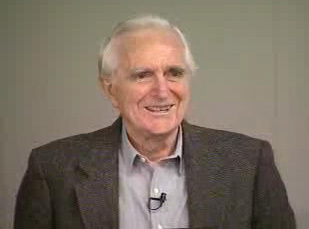 PBS NerdTV #11 Doug Engelbart - Inventor of the Computer Mouse - December 2005 episode devoted to an interview with Doug. Together We Can Get There! 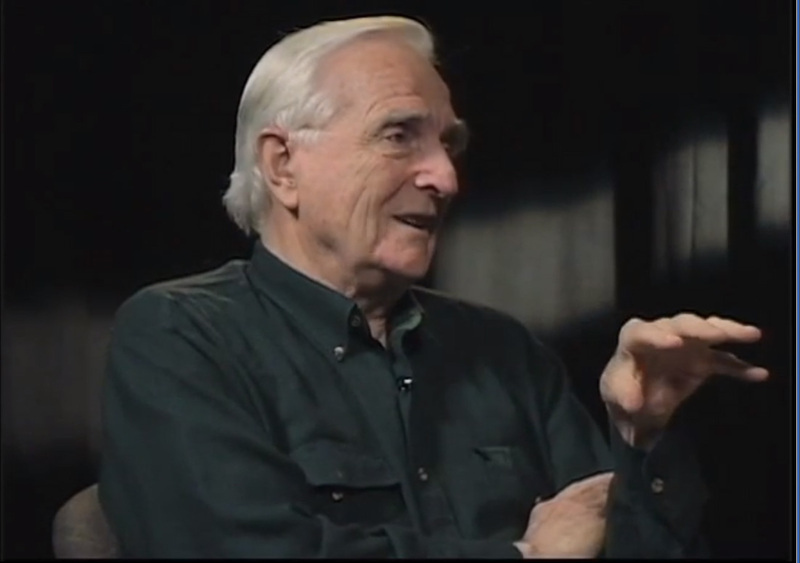 (1991) - Patricia Seybold interviews Doug Engelbart on high-performance organizations and what it will take to achieve them. 90 Minutes. 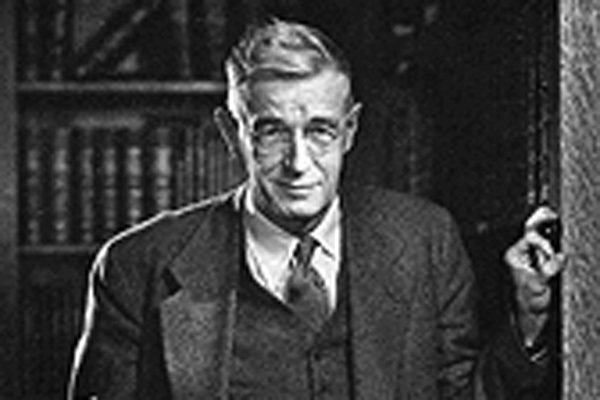 Visit our special subcollections Bootstrap "Paradigm Map", Historic Events, and MIT/Brown Vannevar Bush Symposium.